Goat Format Chaos Zombies are one of those decks that you rarely see, but when you do, they’re a pain. Maybe it’s because Zombies aren’t all that relevant anymore, so people forget how to play against them. Maybe they’re full of weird techs that people don’t prepare for. It could be they’re just lucky and get out their power monsters at the right time. Whatever the case, Zombies are still popular among many less-competitive Goat Format players. Therefore, many people try to keep them relevant, myself included. But because they’re rogue in modern Goat Format, there are lots of different approaches to the deck. Phoenix Zombies, Skill Drain Zombies, Reaper Zombies (aka Jazz’s build) – there’s a number of ways to play Zombies, and each of them have different strategies at their disposal. I’m going to focus on one of my personal favorites, and one that has seen good results in recent testing: Chaos Zombies. Let’s take a look at Chaos Zombies before we talk about it. Zombies, like my Gravekeeper’s, are an aggro deck, but unlike other aggro decks Chaos Zombies don’t have to rely on simplifying the game state. Chaos Zombies can sit tight in complex game states thanks to many of the high number of Goat Control staples the deck runs. And while more conventional Zombie decks eschew Airknight Parshath and run two copies of Vampire Lord, running three copies of Pyramid Turtle allows the deck to turbo Vampire Lord out. This immediately pressures the opponent and forces them into suboptimal plays more often than not. If the opponent spends valuable resources to circumvent Vampire Lord’s recursion effect only, two copies of Book of Life allow him to still come back. This means the deck can function with one copy, giving it room to play Airknight Parshath. Goat Format Chaos Zombies’ unique mix of strategies gives it both standard and unconventional outs to problematic cards. While it has access to Thousand-Eyes Restrict, the inclusion of triple Pyramid Turtle and double Asura Priest allows the deck to play two copies of Creature Swap. Swapping a Pyramid Turtle for a high-ATK beater – and then turning that Pyramid Turtle into a Vampire Lord or a Spirit Reaper – can put considerable pressure on the opponent and lead to huge momentum shifts. But the deck is also able to setup plays like Standard Goat can. It can go big off a double Pot of Greed or Delinquent Duo play, and the inclusion of Black Luster Soldier – Envoy of the Beginning and Chaos Sorcerer gives it the ability to pressure without having to commit to lengthy combos or plays that develop over the course of several turns. It’s Chaos I Tell Ya, Chaos! The addition of the two playable Chaos Monsters to the deck gives Goat Format Chaos Zombies even more outs to problematic cards as well as a solid game-ending play in Black Luster Soldier – Envoy of the Beginning. This gives Chaos Zombies a versatility that other variants that can’t play Chaos-based monsters simply can’t. The inclusion of Chaos monsters also allows you to change tactics on the fly. If one method of generating advantage or securing the field fails, the Chaos monsters make for a convenient plan B. Their inclusion also helps keep the opponent confused; they see Zombies in a deck and many don’t expect to see a Chaos Sorcerer drop. In this way you can keep them off balance, which will lead to more mistakes for them and more wins for you. Countering Chaos Zombies can be a challenge if they’re in the hands of a skilled player; with so many options at their disposal, anticipating threats can be difficult. One has to watch out for Spirit Reaper plays, Book of Life plays, Pyramid Turtle and Creature Swap combos, Faith plays, and a host of other things. But there are some tricks that can lead to wins against Chaos Zombies, too. Since Chaos Zombies don’t play Sakuretsu Armor, an aggressive approach in the early game can do wonders. Outing Pyramid Turtle or piercing through a Spirit Reaper with an early Airknight can lead to runaway damage and advantage generation for you. This will allow you to draw into other counters to their strategy, forcing the Chaos Zombie player to waste resources trying to catch up. If you can effectively shut down their Vampire Lord you’ll have an easier time maintaining board presence. As the main out to Airknight Parshath, taking out Vampire Lord early allows Airknight to stay on the field longer. Since many Zombie players like to pair Vampire Lord with Spirit Reaper for a handy +2 or +3, eliminating Vampire Lord tends to leave Spirit Reaper alone. This usually ends up with him being a damage sink, especially in Exarion Goats. You can mitigate Book of Life plays with a well-timed Call of the Haunted, too; if you remove the monster they target for banishment with Call of the Haunted, Book of Life will fizzle. This can stop Vampire Lord recursion dead in its tracks, cutting the Zombie player off from a potential road to victory. By forcing them away from the Zombie part of the deck, you force them to play the deck more like Goat Control, which should give any Standard Goat player an advantage. 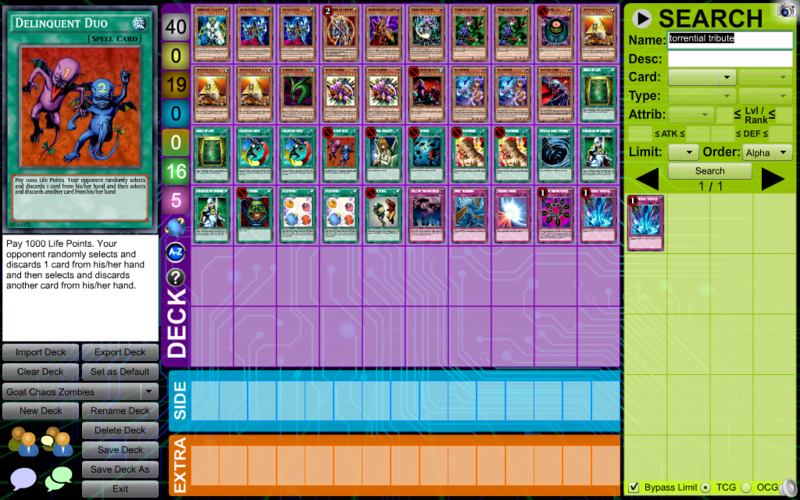 Pyramid Turtle is one of Goat Format Chaos Zombies’ core strategies. A Chaos Zombie player has a lot of options with Turtle at their disposal as well. They can crash into a stronger monster to summon a big beater. They can use Creature Swap to take your beater and then summon Vampire Lord or Spirit Reaper off Turtle. Or they can simply set it. So playing around it is something you’ll want to do. You can also “play around” Pyramid Turtle by letting it go off and dealing with whatever he tutors out. Of course, you’ll need to set up for a play like that. Really, you want to avoid having Pyramid Turtle go off without an answer to whatever it brings out. This is also where Nobleman of Crossout can come in handy. Instead of trying to hit Faith, you can use Nobleman to hit Pyramid Turtle and head the threat off at the pass. One thing to understand about Goat Format Chaos Zombies is the deck plays much like standard Goat Control. So your approach to the match up is not unlike the approach to playing Standard Goat Control. However, you have to anticipate other threats such as Vampire Lord and Book plays. You also need to work to shut down Pyramid Turtle or outing whatever it pulls to the field. This, along with tight but aggressive play, should put you ahead in any given duel. That’s it for this time. As always you can contact me anytime at anteausonyugioh@gmail.com. Don’t forget to stop by the official Pojo Goat Format Thread and check out the Goat Format Discord server as well to continue the Goat Format discussion.